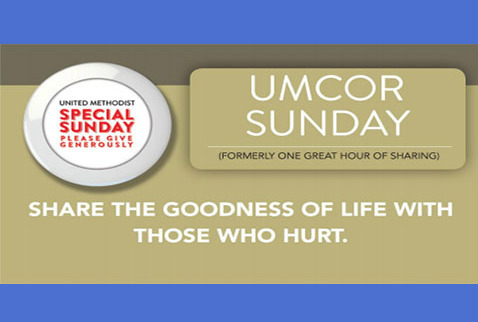 Our April mission project is UMCOR SUNDAY. This is the annual appeal for funds to underwrite the operational expenses for UMCOR (United Methodist Committee on Relief), formerly known as One Great Hour of Sharing. UMCOR is in it's 79th year of helping people in crisis around the world: When tornadoes ripped through Oklahoma, UMCOR responded. When children in Zimbabwe lost parents to AIDS, UMCOR responded. When a massive tsunami devastated lives in Japan, UMCOR responded. And when the next crisis occurs, UMCOR will be prepared to respond. UMCOR's ability to respond is due to the generosity of United Methodist congregations and individuals around the world. Gifts to UMCOR SUNDAY underwrite UMCOR's costs of serving local churches in times of disaster. This helps keep the promise that 100% of every gift made to UMCOR projects goes directly to those in need --- not for administrative costs. Incidentally, operating costs are under 10% of UMCOR's total budget so, if funds collected for UMCOR SUNDAY exceed the amount needed, the overage is directed to the most needy or under-funded UMCOR projects. If you would like to help with this effort, please make out your check to Wesley UMC with UMCOR SUNDAY on the memo line or click on the $ button at the bottom of the page. If you prefer to make a cash donation, there are blue mission offering envelopes in the pew backs. Thank you very much for your support.